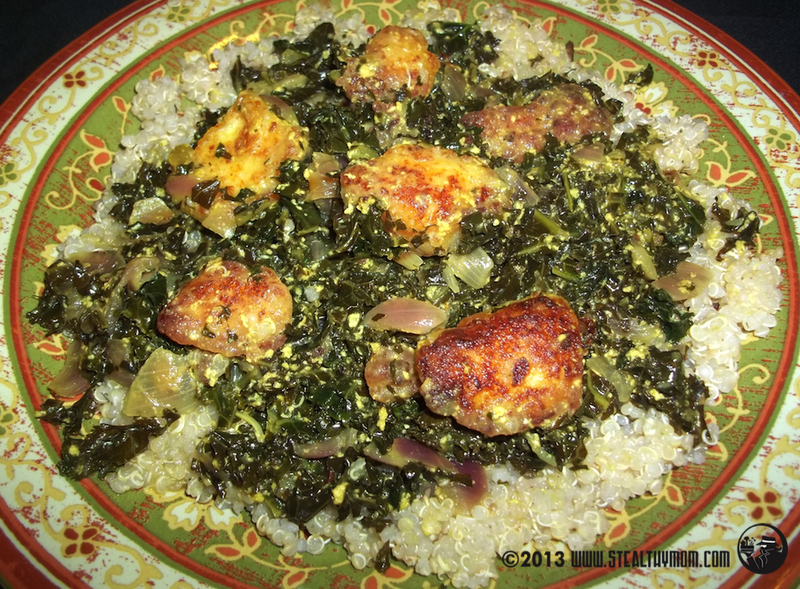 Saag Paneer is a creamy, spicy dish of greens (saag) and homemade cheese (paneer). It was one of my favourites when dining out in college and a rarely seen delight here in the Midwest. The March 2013 issue of the Food Network Magazine had a recipe for Saag Paneer using fresh spinach. It looked really good, but I could not help but to adapt it to kale, simplify it, and tweak a few more ingredients. The result? Scrumptious. (And gone. Next time I'll double the greens so we have a few leftovers. ) For a really authentic experience, there is a great looking recipe for Naan (flatbread) at Plus Other Good Stuff. This is not a spontaneous kind of dish but the homemade paneer can be kept in the fridge for a couple of days and brought out when you are ready to enjoy it. Our version is as mild as you can possibly make a curry, so feel free to double (or triple!!) the coriander and cumin and even add hot peppers if your family likes a little heat. Heat the oil on low to medium heat in a wok or ultimate pan. Cut the paneer into cubes, about three-quarters of an inch. Dredge them in the flour, then fry them until golden in the olive oil. Fish them out and set them aside. In the same pan and oil, sautee the onion. Add the salt, and spices, then the kale and water. Cover the pan and simmer until it bubbles. Stir in the yogurt, butter and tapioca starch and cook, uncovered, until the sauce thickens, about five minutes. Stir in the cheese cubes and cook just long enough to heat them back up. Serve right away over rice, couscous, or quinoa. Heat the milk up, stirring, until it just starts to bubble. Take the pot off the heat and stir in the salt, yogurt, and lemon juice. After a few minutes, large curds will form. Strain the contents of your pot through a clean tea towel or handkerchief. (Not a terry towel.) The leftover whey can be used elsewhere, like for soup or bread. Gather up the corners of the cloth into a bag and gently squeeze out more of the whey. Either secure the end of a pouch with an elastic or tie a knot through the ends, and hang the bag over the pot with a wooden spoon. After ten minutes of dripping, you will have a delicious, lemon ricotta. Twist the bag again to get out more of the whey, then place it between two plates to compress. You won't be able to reshape it once it is hardened, so flatten it out an smooth the edges while it is still warm. Place a can over the top plate for weight, then stick it in the fridge for an hour to harden. Take it out of the tea towel an store in an airtight container. I have never heard of Saag or Paneer, but these look delicious! Thanks for sharing on Foodie Friday. I've only had paneer with spinach my kids love this dish. Can't wait to try it with kale. Looks good! Thanks for sharing with Foodie Friends Friday! This looks really great. I can't wait to give it a try. I love kale, especially since I can grow it all year long. It is nice to find new ways to cook it. I've pinned this so I can try it. Anything to get the kids to eat their greens, I say! Thanks everyone! Just wanted you to know that your recipe is being featured on Foodie Friday today. I will be pinning and tweeting it too this week. Thanks Diane! That is really sweet of you! You bet! Thank you for the invitation. By the way, "real" URLs are always welcome here. I don't consider it poaching; I think it's sharing!